Young people the world over are just beginning their future and English for Adolescents is a rewarding experience which covers so many exciting topics and areas as teens learn not only about the world around them but also their place in it. English for Adolescents is an exciting TESOL field with a wealth of classroom ideas and resources. Topics covered are many and varied from the teenage classroom to student motivation. Teenagers are in a transitional period of their lives and have specific needs and requirements to help motivate and encourage learning. This course deals with the developmental stages of adolescence and student needs. Delving into learning styles and their application in the TESOL classroom, English for Adolescents covers how to motivate students and incorporate techniques such as Multiple Intelligences. Packed with warm-ups, activities, games and resources, English for Adolescents is a must for anyone teaching the 13-19-year age group. Q: How do I deal with behavioural problems in the teenage classroom? A: English for Adolescents will cover not only how to deal with behavioural problems but more importantly how to motivate students and engage them in the lessons. This will greatly reduce the incidence of behavioural problems. Q: What do teenagers like to learn about? 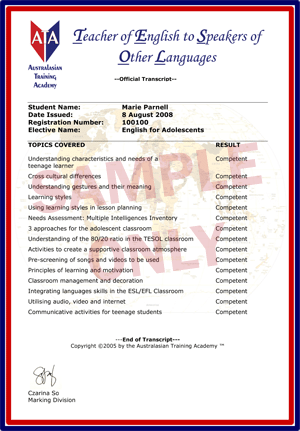 A: English for Adolescents covers in detail topics and activities for the adolescent classroom.